Today I want to write about a tiny little monkey that has a really cool hairstyle, the cotton-top tamarin. These cute little guys are best known for their long white crest of hair and are one of the smallest monkeys in the world, measuring up to 26 cm long, plus a very long tail. They have a wide ranging diet, including fruit, insects, tree sap and gum, nectar and small reptiles and amphibians. They are very active and forage for their food high in the treetops during the day. They also get the water that they need by licking leaves after rain and dew, which means that they don’t need to go down to the forest floor where they are more vulnerable to predators such as snakes, cats (including ocelots) and hawks. Cotton-top tamarins live in small groups of up to 13 monkeys, with only the dominant female allowed to have babies. She is able to develop strange chemicals that stop the other females from having babies. At breeding time, cotton-top tamarins give birth to twins. The entire group helps with raising the babies. Sadly, cotton-top tamarins are one of the most endangered species of primates in the world due to deforestation and because large numbers were taken from the wild many years ago for scientific research purposes. They live in northwest Colombia and there are now only about 6000 left in the wild and they are considered critically endangered. 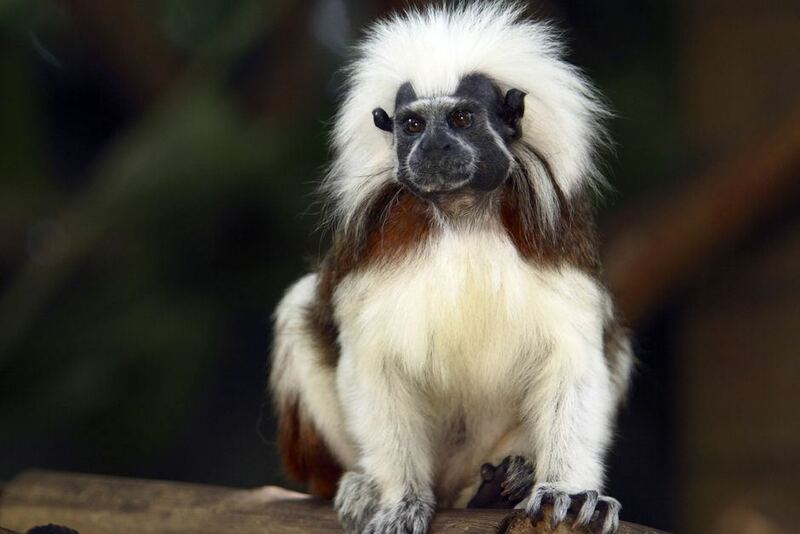 Are there any other interesting facts that you would like to share about cotton-top tamarins? Thanks for those!! I am writing a speech and that was very helpful!! I am obsessed with monkeys so that was amazing!! My son currently has a Marmoset and he lives it to death. I’m getting a Cotton top tamarin. She is currently 2 weeks old and in two and a half weeks she comes to her new home. I’ll probably give her to my daughter as an early Christmas present. She’ll be so excited. I can’t wait. Cotton top tamarins are endangered.